James O’Connor is tired of life on the outside. He wants in. The Mole has previously speculated [see Australian Report Card ] that O’Connor’s future lies in a position other than winger. It’s not because he’s a bad winger: he brings a huge amount to the position. However, it is that well-rounded set of skills and physical attributes that suggest that he might be better suited somewhere else. There’s an argument that says that any winger who moves inside will miss the space afforded to him out wide. While there’s some truth to that, it’s not every winger – and in practice it’s very few – who is as well-equipped to deal with life inside as O’Connor. He’s got the passing game, he’s got an excellent kicking game [both from the ground and out of hand] and he has a great step and top-rank speed off the mark. In fact, he’s got just about every attribute you could hope for. O’Connor is the sort of player that you want to have the ball in hand as much as possible. It’s as simple as that. He has the same sort of ability and presence as El Mago, Juan Martín Hernandez – he can do it all. El Mago had an incredible diverse kicking game that O’Connor will probably never rival, but the hot-tempered larrikin looks to be a faster, more elusive runner. He’s a fierce, destructive tackler who punches well above his weight. Much ado has been made in the recent past about the rise of giants in the No12 jersey [Jamie Roberts, Ma’a nonu, Superstar Sunny-Bull Wull’yums, Yannick Jauzion, Matthieu ‘Jabba’ Bastareaud foremost amongst them], but it’s not the only path the position can go down. The Mole looks on this as a good move by O’Connor on all fronts. He didn’t kick up a stink during the World Cup and insist to be moved inside, even when Grey Man Pat McCabe [dislocated shoulder], Bombproof Rob Horne [fractured cheekbone] and Anthony Faingaa [concussion] were all injured in the group stages. Instead, he waited until the tournament was over, and made his preference known. 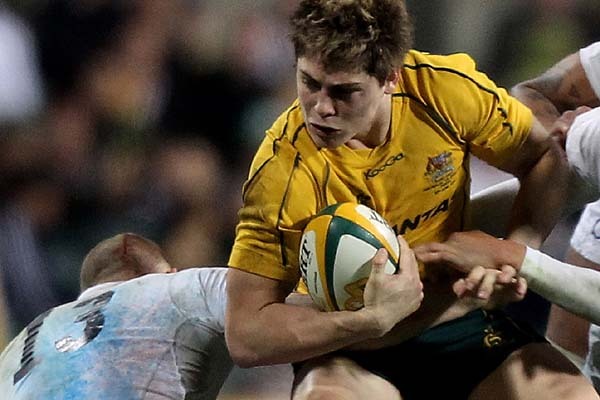 In terms of what it can do for the Wallabies, it opens up getting all their best players in the backline together. Drew Mitchell can come back in on the wing, where he was so effective up until his ankle injury, and Two Dads can continue in the No13 jersey. The Twin Danahers midfield will be confined to distant memory! This entry was posted in News and tagged Australia, Dingo Deans, Grey Man Pat McCabe, Hot-tempered larrikin James O'Connor by dementedmole. Bookmark the permalink.